Are claims of fulfilled Bible prophecy all false alarms from overly-active imaginations, or is there something more going on? That phrase, "lock and load", means to prepare for battle in one way or another. But "lock" can also refer to that which denies access to something held in safety or secret. 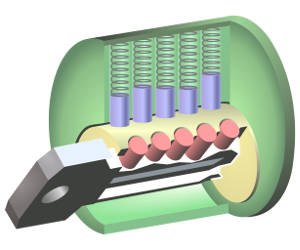 A tumbler lock has a series of pins that must be set to different specific heights in order for the lock to open. All but one of the pins could be set, and it still would not open. This illustrates an aspect of Bible prophecy that many people don’t consider. Those who see fulfillments are mocked when nothing happens. But perhaps prophecy is more like a tumbler lock than a single bolt. That is, some of the "pins" were indeed set correctly, just not all of them. So if someone sees, for example, increasingly bizarre weather and evil behavior as fulfillments, they aren’t wrong; they just don’t know how many "pins" remain to be set. And with each passing day or "pin setting", the fulfillments may repeat but include new details. So the error in many failed predictions is not that events are being misinterpreted, but that the "number of pins" is misjudged. We should not say that bizarre weather and increasing evil in the world mean the end is upon us, but that they are signs along the way. As time passes, we see more and more events and situations "line up", which tells us that the end certainly approaches. But we cannot know the final "pin" has been set until the "signs" give way to reality, meaning for example that instead of guessing who the Antichrist might turn out to be, there is no doubt. Even then, there are many whose ego or arrogance lead them to believe that there is no doubt in spite of the fact that doubt certainly still exists. Since the dispersion of Israel in 70 a.d., the only world event that surely indicated a "pin" was WWI and then WWII, which was really a continuation of WWI. The reason we know this is because the result was the formation of a nation for Israel, centuries after it was written off and Bible prophecies about them were then reinterpreted to apply to the church instead. The few who believed the prophecies referred to a literal nation of Israel and a literal temple were mocked until then. But now Israel exists, in its ancient location, speaking its ancient language, and in unbelief as predicted, since God promised 7 more years of judgment and cleansing for them before Jesus would return to the earth to set up his kingdom. Now since that major "pin" has been set, other events that ordinarily might not have meant anything suddenly become significant. The political landscape changed drastically after WWII, and there is some speculation that Israel was formed for the nefarious purpose of getting all the world’s Jews to gather in one place for easy extermination. Practically before the ink dried on the Balfour Declaration, Israel was attacked unsuccessfully. Yet regardless of human purpose or plan, God predicted it, and it has come to pass. So each time we see another step toward the end times, we need to remember that the full "number of pins" is not revealed to us, nor is the degree to which each pin might move; that is the severity or intensity of the fulfillment. It seems that with each passing day we ask, "How much worse can it get?"... and it gets worse and worse. So we not only don’t know the degree of each pin’s movement, we don’t know how many there are. Thus we should always temper our warnings and excitement because of this limitation. We do know that the world will resemble that of the time of Noah, as Jesus told us. And it’s hard to imagine that it could have been worse than it is now, with the horrors of abortion, Christian and Jewish persecution worldwide, depravity of all kinds, and an encroaching deep evil that even unbelievers can sense. It seems that the world is quickly losing any semblance of humanity or basic compassion, becoming cold-blooded and ruthless. After WWII there was America to run to, but now there is nothing; there is no place on earth that the wicked puppet masters of the world cannot reach and destroy. Prophecy teachers of even a decade ago really didn’t see things getting quite this bad before the end. On all fronts, from nature to nations, time seems extremely limited. And in view of the fact that the world has to be functioning on some level of normalcy during at least half the final 7 years, how much longer can the end be delayed? How many more "pins" can there be? Perhaps fewer than we think. So always be ready, especially spiritually. Be ready to stand before God and be judged for your life. Do whatever you know you were put here to do, and do it quickly.